Photo via Le Bon Coin. Got $14 mil sitting in your bank account, collecting dust? 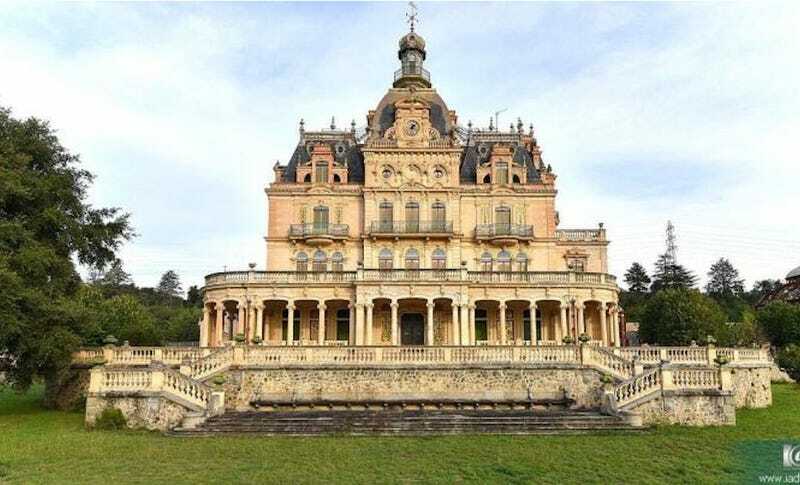 Put that money to work and acquire this magnificent French chateau. It’s even 50 percent off its initial listing price from five years ago—what a steal! Château d’Aubiry is located on the mountain chain of Les Aspres, close to the historic town of Perpignan and the Spanish Border (Barcelona is 150 km away). At the dawn of the Belle Epoque, French industrialist Pierre Bardou-Job had made his fortune selling cigarette paper invented by his father, but he was also a dedicated patron of the arts and an avid collector of eclectic curiosities. He commissioned the Danish architect Viggo Theodor Dorph-Petersen, a celebrated talent amongst the bourgeoisie of the epoch, to design a château for each of his three children. “When it was completed in 1904, the palatial home boasted 40 rooms, including an early movie theatre, observatory, photography lab, library, billiards room and 15 bedrooms, many of them themed, one decorated in honour of the last emperor of Indo China Bao Dai,” the site adds. It’s suitably impressive. So let’s play “guess the catch.” Bet the plumbing needs work, and do we think those floors are original? They might be; the home is apparently an official, protected French historical monument—which presents its own set of headaches. $14 million and you’ve still got to deal with those goddamn radiator noises. Plus this greenhouse—designed by Gustave Eiffel, of Eiffel Tower fame—is beautiful but I’m confident it would also be a great gift for an enemy you were looking to bankrupt. Would I still live in this house? Yes, obviously.